This is a pair of Luftwaffe shoulderboards piped in the yellow branchcolour as worn by an 'Unteroffizier der Flieger/Fallschirmjägertruppen' (Pilot/Paratrooper). All buttons are present. The insignia has been replaced. The tunic shows some wear on the back with an field repair, the bottom of the sleeves shows wear and on the frontside there is a small damage (above the left pocket). 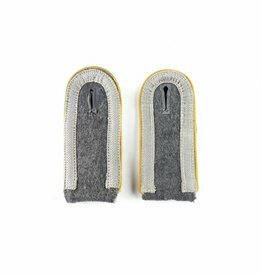 The shoulderstraps as intended for 'FLAK artillerie' are in Luftwaffe blue/grey wool and red coloured waffenfarbe piping. The forward edge of the collar is also trimmed in silver, NCO’s tress, twisted red rayon cording and the collar has red wool collar tabs with three rank "gulls" to each. In overall fine condition. Dated 1938. Original Luftwaffe blue coloured steel construction belt buckle. 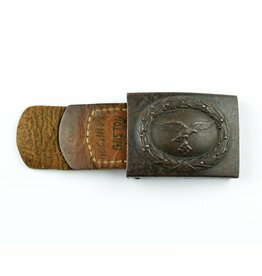 The original leather tab is maker marked B. Haarmann, Lüdenscheid 1941. 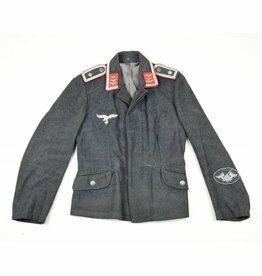 This is a Luftwaffe (airforce) machine embroidered breast eagle. 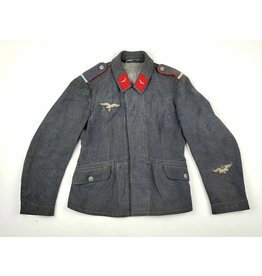 Nice uniform removed example, perfect for display. Very nice original FLAK-award (Flakkampfabzeichen). An award for air defence crews including searchlight and sound detection personnel. Luftwaffe helmet chinstrap. 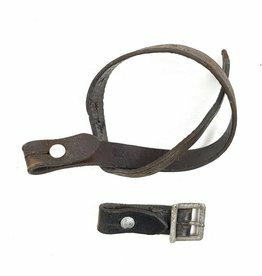 This is an early leather chinstrap what is maker marked and dated 1937. L.B.A. marked. 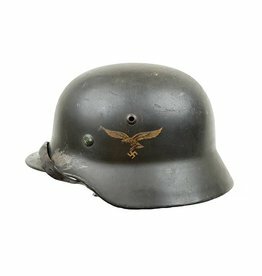 Luftwaffe M35 double decal combat helmet with almost completely intact decals. This helmet is manufactured by the company 'Q62' with serialnumber 1811.